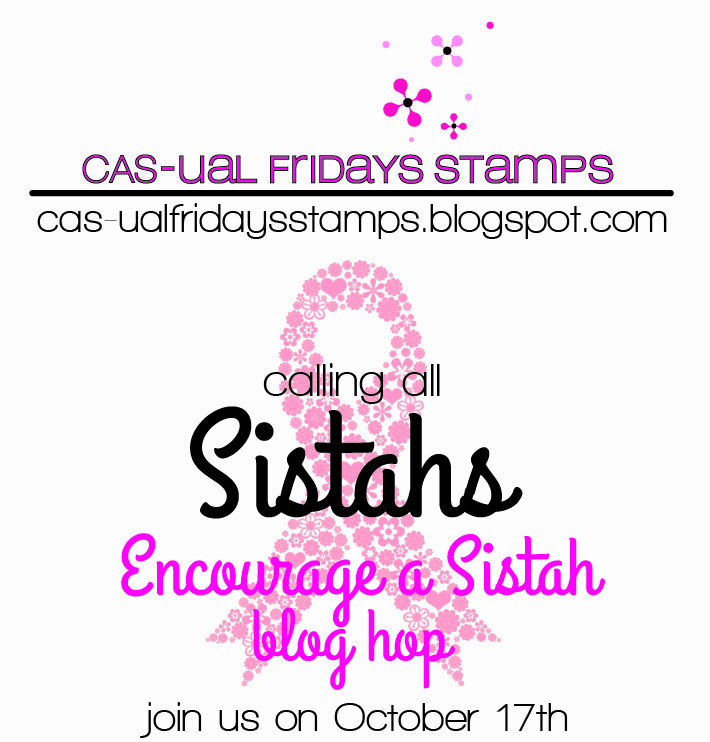 CAS-ual Fridays Stamps: October 17th: Calling All Sistahs! October 17th: Calling All Sistahs! 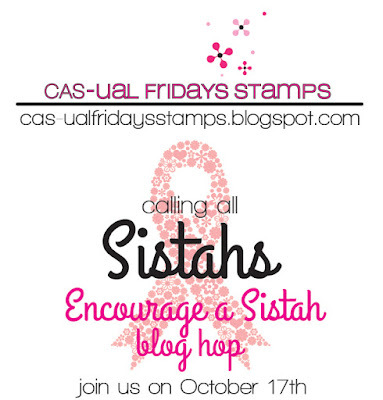 our Calling All Sistahs blog hop! 1 year ago this month I had my lumpectomy. It's a BIG day for me and I'm not gonna lie, I'm nervous. I will update here later in the day with the verdict. Thank you so much for all the support and love I've been receiving today, you all rock! Calling All Sistahs collection about this time last year. That's money that goes directly to awareness and research programs. But I know we can raise more! This awesome set will be a go-to for encouragement. It's design will reach past breast cancer and be useful for any type of cancer. The big word ribbon was designed to fit with our Ruffled Ribbon Fri-Die. This brings us to our blog hop! and the lives of my family and friends and sistahs. and get those mammograms scheduled! Today's hop is about encouraging someone who is going through this right now. You'll see lots of super projects and many of them will use our brand new Word Ribbon set. Be sure to leave some love at all the stops. and 1 lucky random commenter will win the whole release! CAS-ual Fridays Stamps <<<You are here! Do your self breast exams. You're my sistahs and YOU matter to me! that you will absolutely flip for! Here is wishing you good health and loads of success in your noble initiative. It is a very important issue that needs our collective attention. Thanks for bringing it to the fore :) hopping on to see the awesome creations now. Wow such pretty creations and have to say the words ribbon stamp is very apt and awesome!! The ladies on the hop have created magic with it. Hopped over to all the blogs except a couple that i could not seem to find. Thanks for creating awareness about breast cancer. Best wishes for your test today. I love the new beautiful word ribbon stamp! It is a must have for sure! All the cards in the hop are beautiful! 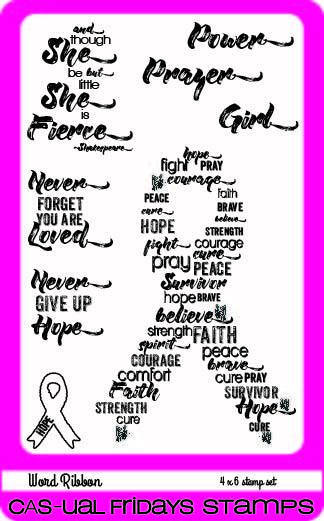 Thanks so much for sharing your story and creating this wonderful line of stamps so we can stand strong with our sistahs! All these cards show a great deal of encouragement. Thank you for sharing this hop. Michelle~ Congratulations on kicking this nasty diseases *SS! I am a three time cancer survivor so I know the joy of getting the news that you are disease free! It seems like I get cancer every 12-15 years and I refuse to let it beat me! I love this stamp set and wish I could afford to purchase it but the budget doesn't allow for it right now. I hope lots and lots of people buy it and that the money raised will be the amount that funds the CURE to eradicate this disease! Wouldn't that be awesome? I am off to hop and see what the designers have created with this awesome stamp set!!! Thanks for having me along on this meaningful and inspirational hop! Congrats, Michelle, on one year! Also congrats on the new stamp set for this awesome cause! What a great stamp set! Congratulation on one year "C" free!! YOU inspire me, Michele! Congratulations on being 1 year cancer free!!! Enjoy a supersize glass of wine tonight in celebration. Hopes and prayers with you Michele! Your commitment to this cause is humbling - you are an amazing lady who I love and admire! thanks for the monthly reminder. Glad your news was so good. My good thought to you, I am proud of your post . Love your card. So glad you have made the 1year mark cancer free ... I am 1 year post Thyroid Cancer surgery so I understand where you are coming from .. I love all of your stamps and how committed you are to raiding not only $$$ but awareness ... I would love these stamps to pay it forward to those who supported me even as they fought their own battles ... Thank you so much !!! So in love with the new stamp!! You are changing and saving lives... You are an inspiration to many!! Great set, inspiring blog hop and thanks for the reminder. Oh My Goodness! I just finished the hop and I'm so glad I did it. So glad to know about the group too. My sis in law just started her radiation this morning for breast cancer. She went for her annual mammo and they found the tiniest of lumps, she had that removed and it was very well defined and nothing in the lymph nodes at all. She is at stage 0 and we are all confident that she'll be cancer free once she finishes her radiation. As usual she will be taking the inhibitors for 5 yrs too. Thanks for doing these hops, it's a fabulous idea to remind us all to do our checks. So glad your mammogram came out good! Now I'm gonna hop, hop, hop! Thank you for calling attention to the importance of breast exams and for supporting breast cancer awareness with your stamps. The cards from your DT are both beautiful and inspiring! Thanks for continuing to remind us all. Prayers for continued good health. Congrats! So happy you are Cancer Free! Thanks for the monthly reminders it is so important to keep on top of this disease. I have had many biopsies which have all been benign thankfully but you never know when it will go the other way. Congrats on your good news!! Congratulations on your first year cancer free! I sure hope all continues that way!! What a terrific stamp set! Congratulations Michele! I am so happy for you!! Loving the new sets, they are so powerful!! That is such a pretty stamp set. Love the projects made with it. Long life and happiness to you!! I came back to see if you mentioned your appointment and YAY!!!!!!!!!!!! Happy Cancer FREE!! So incredibly happy to hear.